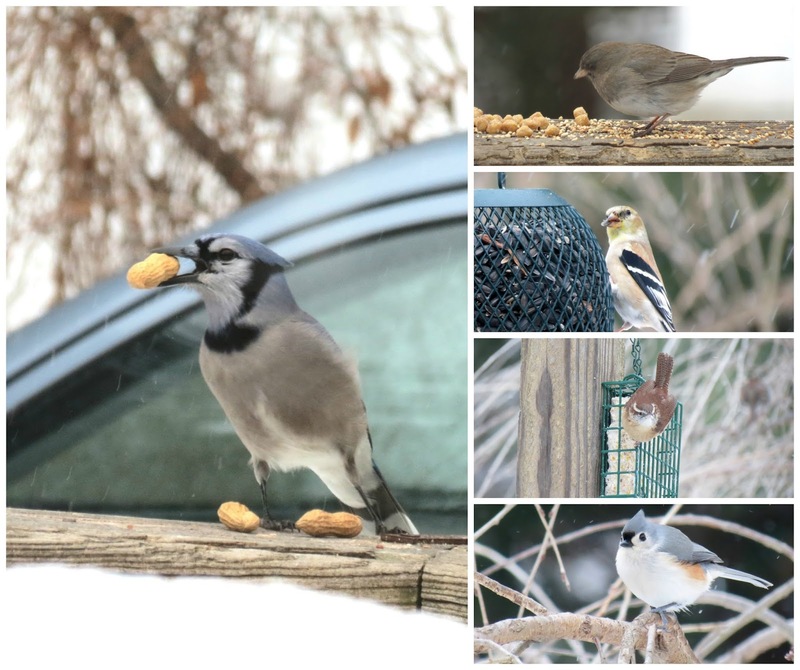 Above are some of the birds I counted for my Great Backyard Bird Count. 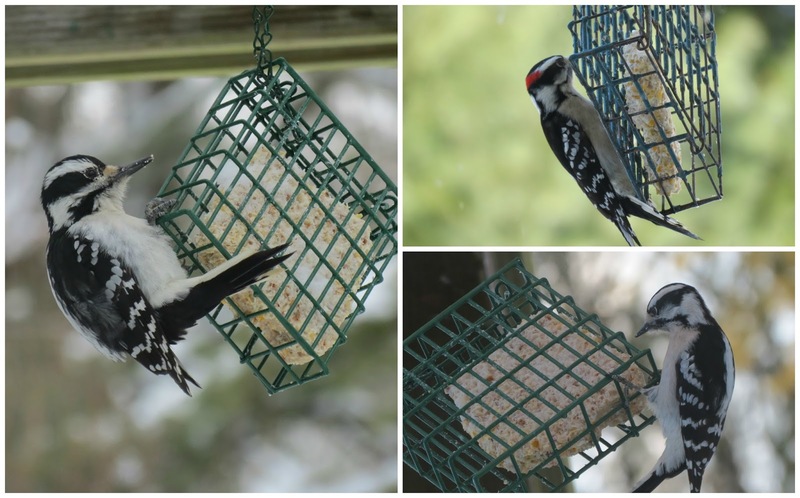 Top row is a Hairy Woodpecker with a Cardinal, two Goldfinches with a Mourning Dove and a female Cardinal. 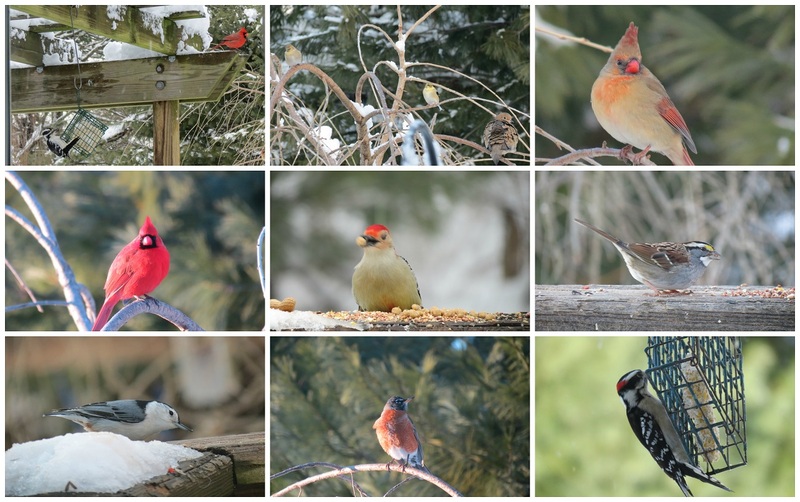 Middle row is a male Cardinal, male Redbellied Woodpecker and a White-Throated Sparrow. Bottom row is a White-breasted Nuthatch, American Robin and a male Downy Woodpecker. When hubby and I moved from a crowded suburb to our more rural home, I started noticing the beautiful birds around our yard. Some of the first birds to attract my attention were the beautiful bright Yellow Goldfinches and the Eastern Bluebirds. These pretty birds were not noticeable while living in the city or the suburbs. It was in my rural backyard I really started paying attention to the birds coming and going. I starting feeding the birds, I bought the heated birdbath and we started planting to attract the birds and wildlife. Now, I can sit back and just look out my windows to count my yardbirds for the GBBC. It may be too late to participate in this year’s GBBC but next year you can keep this in mind and become involved in this Citizen Project and join in on the count. I hope you enjoyed my backyard birds..Have a great day and happy birding. I always enjoy your posts and pictures Eileen! !So beautiful birds in your yard! !My favorite,the Cardinal and the Woodpecker! Great shots and captures! !Wish you a happy new week! Lovely birds and collages.. Greetings from Spain..
gosh, what a spectacular! what a great project! 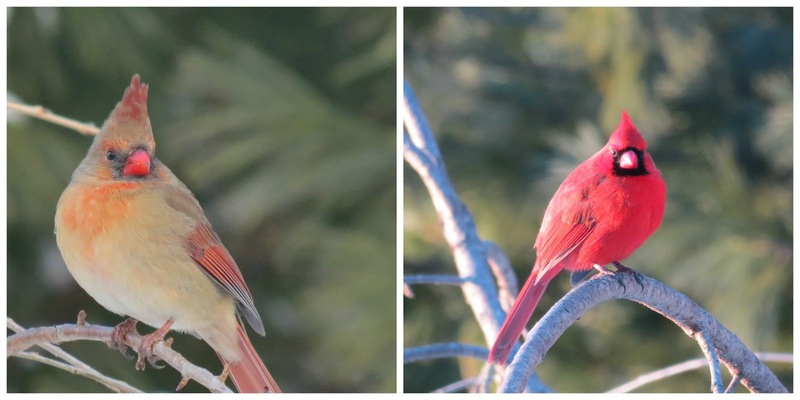 i always love seeing your backyard birds, eileen. it must be a real treat to have these visitors each day. This summer, my daughter and I plan to re-do our backyard to attract more birds. And, I will tell her about the bird count. I know that she would love to do that. Always great shots!! Favorite is the Blue Jay with the huge peanut. I could sit all day on our screen porch and watch the birds around the feeder and the interactions of the birds, squirrels and chipmunks. A good way to feature the birds from your yard. I spend so much time at our big window overlooking the backyard and merely because I enjoy watching the birds so much. 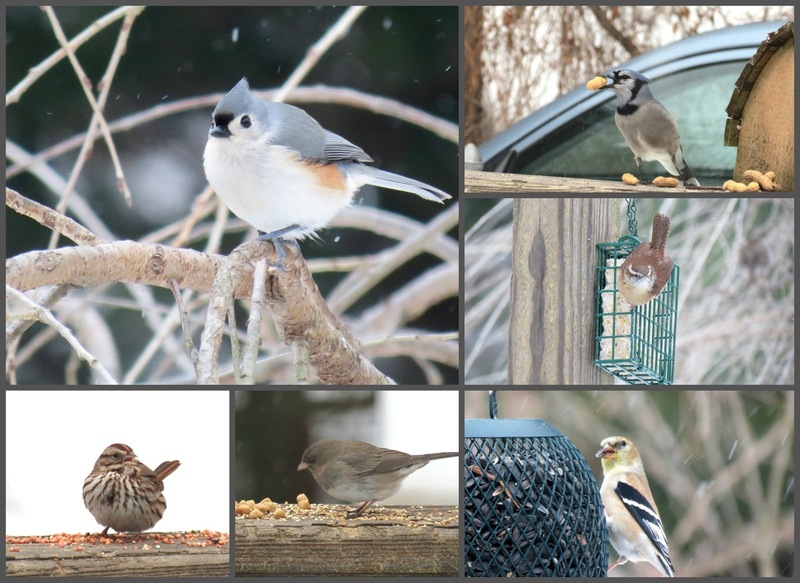 I participate and submit a couple reports from my yard:) It's always fun to make your backyard feeders the focal point. It's easy as well:) Really great birds. Eileenin, I love your birds. Hi Eileen, I always appreciate seeing your birding posts. Excellent photographs and accurate information about the various birds featured. You have been kind and helpful to my blogging efforts as well. Many thanks! You certainly see tons of birds in YOUR backyard! I'm going to try to participate next year. Wonderful shots of your backyard birds. Love all your visitors . . . especially the large peanut in the mouth jay! That peanut is too big for him. eine Freude für Herz und Auge..
Great and beautiful to look at. What sweet pictures of your birds♡♡♡ I can really feel the LOVE for them, my friend. Well done. I simply haven't gotten into GBBC. I'm happy to share your birds, many thanks! You have quite a variety of birds in your backyard, Eileen! They are all so wonderful to see! Love this collection!! I need to go buy some peanuts in the shell. Amazing how much the jay can fit in his beak! What wonderful photos and great encouragement to start watching and counting birds, Eileen! Piękne ptaki teraz widujesz i to jest cudowne. Pozdrawiam. Beautiful birds now seeing, and it is wonderful. Yours. You're a good ambassador for the Count, Eileen. If I'm at home next year, I'll do it myself, but don't think I'll have a many beautiful ones as you have as a result of your hard work. Looks like you created a wonderful place for the birds in your area to flourish. I counted many of the same birds in this years GBBC that you have featured in this terrific post. Love all of the fantastic photographs of your backyard birds!